The most gorgeous dining at Disney Springs, but come prepared for loud music. 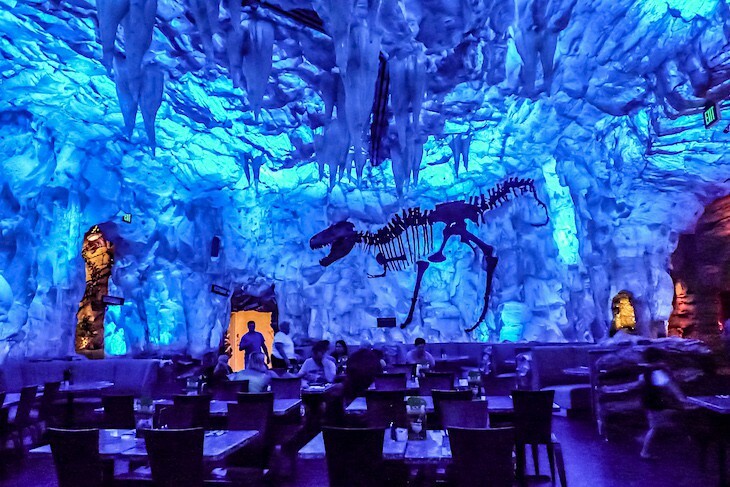 A roaring good time, but don't come for the food. Cuban cuisine at Disney Springs™West Side. Lunch and dinner; call WDW_DINE or 407-934-2628 or go to OpenTable.com for reservations; casual dress. Open daily Sun-Thur 11 a.m.-11 p.m.; Fri and Sat 11 a.m.-midnight. American cuisine at Disney Springs™The Landing. Lunch and dinner; call 407-WDW-DINE or 407-560-0100 for reservations; casual dress. Open daily Sun-Thur 11 a.m.-midnight. ; Fri and Sat 11 a.m.-1 a.m. If someone had told me that Southern country cooking would be my favorite cuisine at Disney Springs, I would have begged to differ. But sure enough, Chef Art Smith’s Homecomin' is one restaurant that really stands out from the crowd. Serving local, farm-sourced ingredients in a cozy, welcoming setting right on the “Springs”, it’s one place that I will more than likely visit with each trip to Walt Disney World® Resort. Opt to dine in the bar, the dining room, or, if the weather is nice, on the screened porch overlooking the water. The wait staff, dressed in jeans and blue-and-white gingham shirts, is super friendly and really seem proud of what they are serving, as they should be. Starters here are pretty darn amazing. I couldn’t get enough of the Jasper Board with it’s assortment of pimento cheese (the best! ), smoked fish dip, smoked sausage, thinly shaved dry-cured ham, bread and butter pickles, savory spicy/sweet candied pecans, and crispy bread wafers. All are made in-house except for the ham which comes from Tennessee. And can we talk about the fried green tomatoes? Here they have a new twist. Lightly breaded then fried, topped with shaved Tasso ham, on a bed of watercress and arugula, all drizzled with remoulade—truly phenomenal! You just have to order the legendary fried chicken—no more said (Just kidding. I always have more to say!). This is seriously great chicken, buttermilk-brined for 24 hours then crispy fried to perfection. Add to that a sprinkle of the restaurant’s house-made hot sauce and yummy biscuits spiked with just a touch of cheddar cheese, it was love at first sight. Cajun/Creole cuisine at Disney Springs™West Side. Lunch and dinner; call 407-WDW-DINE for reservations; casual dress. Open daily Sun and Mon 11 a.m.-11 p.m.; Tues and Wed 11 a.m.-midnight; Thur-Sat 11 a.m.-1:30 a.m.
Mexican cuisine at Disney Springs™Town Center. Lunch and dinner; call 407-WDW-DINE or 407-560-9197 or go to OpenTable.com for reservations; casual dress. Open daily Sun-Wed 11 a.m.-10 p.m.; Thur-Sat 11 a.m.-10:45 p.m.
Frontera Cocina is a modern but casual take on old-style Mexico. Developed by celebrity chef Rick Bayless, six-time winner of the James Beard Foundation Award, you'll be delighted by his award-winning dishes. Its front dining room is set around a lively open kitchen presided over by a bright Aztez-influenced mural and a rich palette of bright tangerine, sky blue, and lime green. 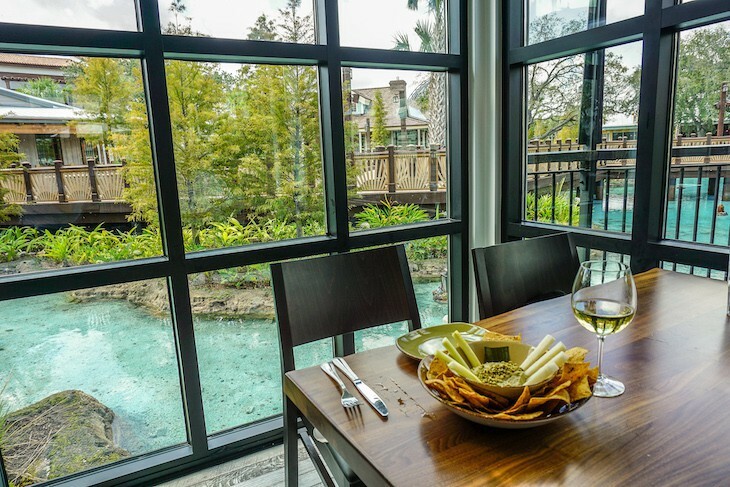 I prefer the back room where you’ll find the bar and superb views of Disney Springs waterway. Or on balmy days request a table on the back patio. You must start with sikil pak, a Mexican version of hummus, but this time made from pumpkin seeds instead of chickpeas. Sprinkled with ground seeds, splashed with a touch of habanero (expect a bit of a kick), sided with fresh and crispy tostado chips (too salty for my taste), cucumber and jicama matchsticks, it definitely puts your run-of-the-mill hummus to shame. Shrimp mojo de ajo, roasted in a somewhat garlicky chipotle sauce, spiked with grilled zucchini and served over rice mixed with plantains, is cleverly served in a small iron skillet. There wasn’t enough spice to make me happy, but the shrimp were plump and tasty. A platter of roasted pork carnitas were slightly crispy on the outside, tender on the inside accompanied by chunky guacamole and refried black beans topped with my favorite Cotija cheese—if you don’t fat with your meat then choose something else. Both plates were served with superb baby corn tortillas. Ask for sides of both types of salsas: a smoky red chipotle and a tart green (salsa verde). The creamy queso añejo mashed potatoes are a pleaser, again topped with Cotija cheese then quickly oven browned to perfection, although I prefer them mashed without the skins. Trattoria-style Italian cuisine at Disney Springs™The Landing. Lunch and dinner; call (407) WDW-DINE, or (407) 560-8466, or at OpenTable.com for reservations. Open Sunday for brunch 10:30 a.m.-2:35 p.m. and dinner 5:00 p.m.-10 p.m.; Mon-Thurs for lunch 11:30 a.m.-3:30 p.m. and dinner 5:00 p.m.-10 p.m.; Fri-Sat for lunch 11:30 a.m.-3:30 p.m. and dinner 5:00 p.m.-11 p.m.
Pan-Asian cuisine at Disney Springs The Landing. Lunch and dinner; call (407) WDW-DINE, or 407-939-6686, or go to OpenTable.com for reservations. Open Mon-Thurs 11:30 a.m.-midnight. ; Fri, Sat, and Sun 11:30 a.m.-1 a.m. Dim Sum brunch on Saturdays and Sundays from 11 a.m. to 3 p.m. 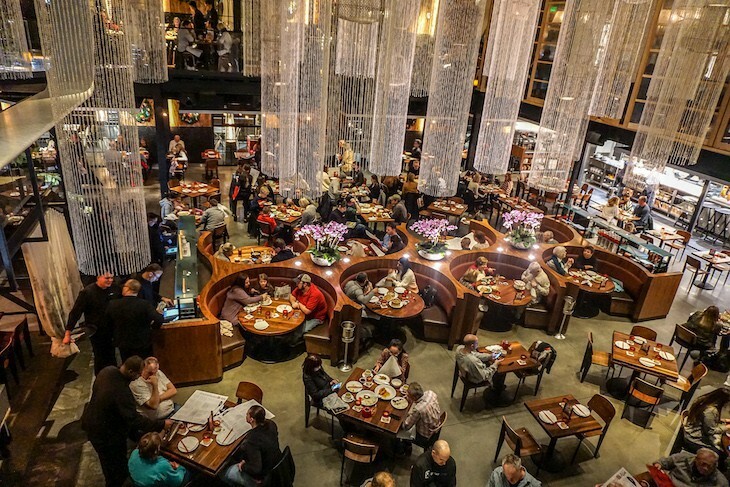 Dining at Morimoto has long been associated with the merging of Japanese culinary tradition and the American palate. At Morimoto Asia Restaurant at Disney Springs, the Pan-Asian cuisine also extends to the food of China, South Korea, and Thailand. Operated by the Patina Restaurant Group, the restaurant is a visually stunning, two-tiered affair lit with impressive 20-foot long chandeliers, an open exhibition kitchen where diners can watch the preparation of the restaurant’s signature dishes such as crispy Peking Duck, a lounge in the Shanghai tradition, an outdoor terrace, and a sweeping staircase that leads to an additional dining space, a sushi bar and second-floor lounge. I would ask to sit in the downstairs, orchid adorned, main dining area to really catch the flavor of the happening scene. If you’re clever you’ll insist on ordering the light and crispy rock shrimp tempura doused with spicy Korean gochujang red chili sauce. And be sure to share a half rack of Morimoto spare ribs. None like you’ve had before, these gems are thick, meaty, and sticky, crisp on the outside thanks to a quick fry in cornstarch, tossed with a hoisin sauce and sprinkled with cilantro—quite the indulgent treat. Duck "Nasi Goreng", an Indonesian duck fried rice dish spiked with edamame and tomatoes, is interesting with its topping of a sunny-side-up egg, but certainly not memorable. Lobster Chow Fun is innovative and quite tasty, a whole, but small lobster, wok fried and served atop fiery rice noodles stir-fried with crispy Chinese vegetables. The shell is left intact, but no real work is required since the lobster meat simply pulls out with a shellfish fork making for easy eating. However, not a terribly filling dish with only about six bites of meat. Tender and tasty, a side of Szechuan long beans is a good choice, but perhaps a bit less sauce is preferable. I do feel as if too many dishes have the same, slight cloying, hoisin-style sauce so be careful when ordering that you vary the dishes to avoid this issue. While I’m not exactly blown away by the food like I was the last time I dined at a Nobu (Chef Masaharu Morimoto was once Executive Chef at the original Nobu in New York City) and the wait staff can be fairly indifferent, the restaurant does bring a fresh sense of style and sophistication to the Disney scene. Beware that the sushi and sashimi menu is a bit bare bones, something you would not expect from a restaurant who built their name on sushi. 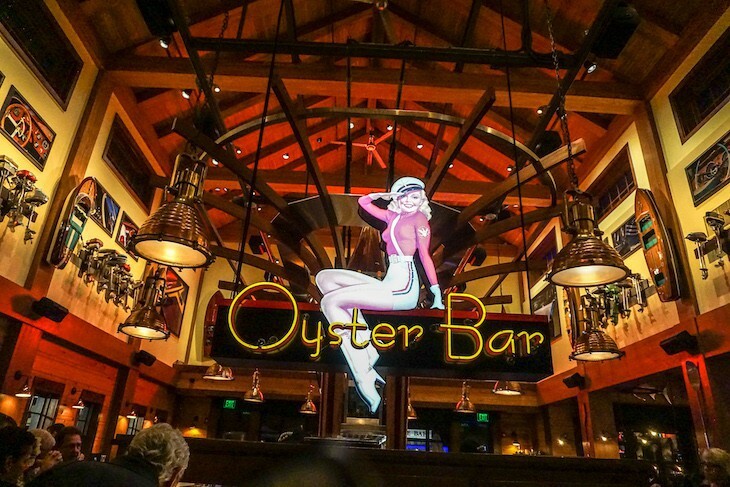 Seafood and American cuisine at Disney Springs™The Landing. Lunch and dinner; call WDW_DINE or 407-934-2628 for reservations; reservations also available on OpenTable.com. Casual dress. Open daily Sun-Thur 11:30 a.m.-11 p.m.; Fri and Sat 11:30 a.m.-midnight. 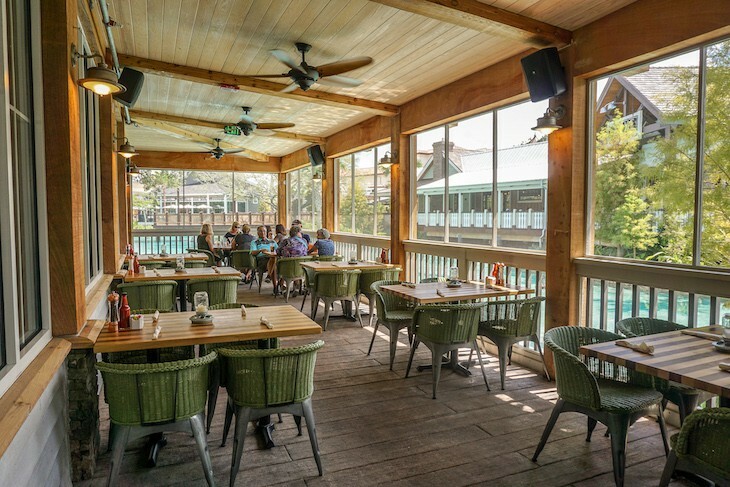 Dine on fresh seafood on a paddleboat anchored on Lake Buena Vista. Favorites include Florida stone crab and lobster guacamole. 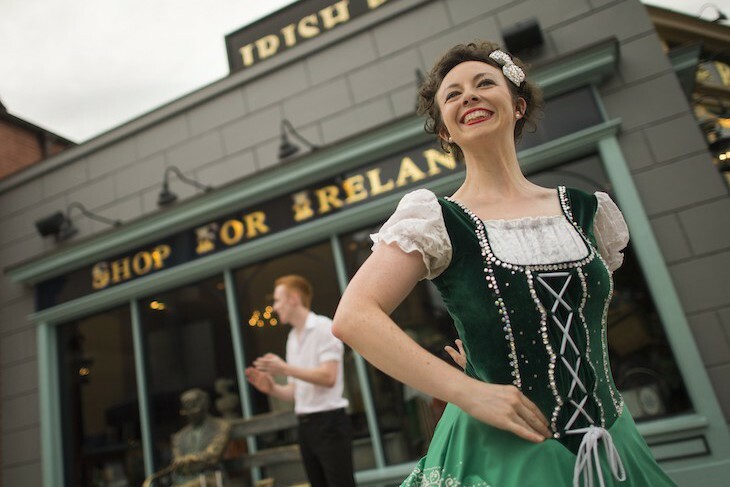 Irish food and music at Disney Springs™The Landing. Lunch and dinner; call 407-WDW-DINE or go to OpenTable.com for reservations; casual dress. Open daily, lunch 11 a.m.-2:45 P.M., dinner 3:00–11 p.m., bar menu 11 p.m.-1:00 a.m., Rollicking Raglan Brunch Menu 10.00am-3.00pm Saturday & Sunday. American cuisine at Disney Springs™Marketplace. Lunch and dinner; call 407-827-8500 for reservations; casual dress. Open daily 11:30 a.m.-10:30 p.m.
Steakhouse at Disney Springs™The Landing. Brunch (Sat and Sun) and dinner nightly; call 407-WDW-DINE or 407-560-0100 or go to OpenTable.com for reservations; casual dress. Open Saturday and Sunday for brunch 11 a.m-3 p.m.; and for dinner Sun-Thur 5 p.m.-11 p.m.; Fri and Sat 5 p.m.-midnight. STK is quite the glamorous Disney Springs hot spot offering tender steaks and plenty of bling to go along with them. It’s red brick exterior is in stark contrast to the upscale interior, not your average masculine steakhouse. Rather it’s clubby and glitzy, a place where DJ music blares, and not exactly conducive to fine dining. So if it’s a quiet meal meal you are looking for then look elsewhere, or at least book an early dinnertime ahead of the DJ’s arrival. There are several seating areas to choose from, the best and most alluring being the two-level, downstairs dining room (dinner only) with white leather banquets on its upper level towered over by stunning white floral arrangements and strange angled mirrors. 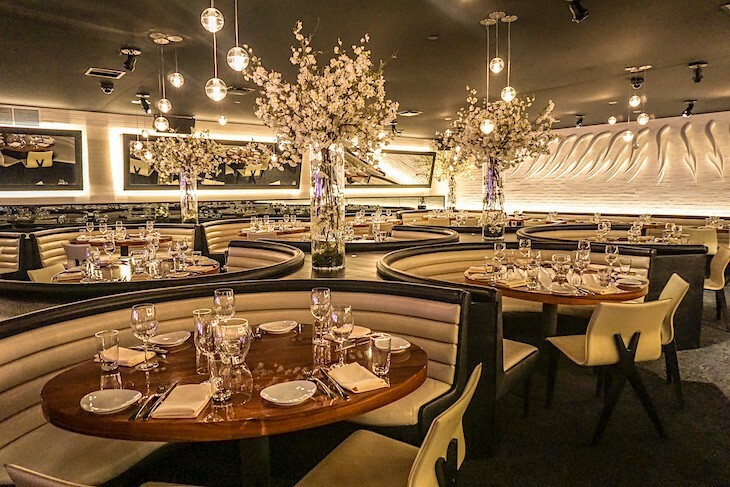 The lower level wood tables with curved white leather chairs share the space with a swanky bar. Climb a steep but enchanting marble staircase to reach the much more casual upstairs bar and dining area and adjoining rooftop terrace overlooking Disney Springs, where both lunch and dinner is served. The crunchy Rock Shrimp is a definite winner, lightly fried in a tempura-like batter and dressed with a slightly spicy chili remoulade. The restaurant’s Blue Salad is made perfect with tender baby iceberg lettuce, a smattering of smoky bacon, and baby cherry tomatoes, but the savory Point Reyes Blue cheese is absolutely the highlight of this dish. If you’re a burger lover than you can’t get much better than STK’s Wagyu version, thick and flavorful, made perfect with Point Reyes Blue cheese and bacon (yes, more blue cheese and bacon! ), and, best of all, sliced cherry peppers to liven things up a bit. That said, it certainly should be good for a $28 price tag! The fat, crispy side of fries helped ease the pain. A wide range of delicious steaks are on offer, but consider the 32 oz. porterhouse, enough for 2, which arrives at the table beautifully sliced. Strangely enough, the skirt steak was what I felt the need to try. Quite flavorful, also arriving pre-sliced, and made even tastier with the peppercorn crust and chimichurri sauce options. Seafood at Disney Springs™The Landing. Lunch and dinner; call (407) WDW-DINE, or (407) 949-2628, or go to OpenTable.com for reservations. Open Sunday through Thursday 11:00 a.m. to 1:00 a.m.; Friday, Saturday, and Sunday 11:00 a.m.-2 a.m.
Dream boats from the 30’s, 40’s & 50’s found both inside and out on the water and dining in a replica of an old boathouse are this Disney Springs restaurant’s claim to fame. Most of the restaurant is built out over the water, certainly adding a nice touch to the theming. Arrive ahead of your reservations for a drink at one of three bars: the front room’s Captain’s Raw Bar with 30-foot ceilings, the smaller Admiral’s Club Bar, or, my favorite, and the one-of-a-kind Dockside Bar built out over the water with fabulous sunsets. Then get ready to feast on fresh seafood, steaks, and selections from the raw bar. On balmy days request a seat outside for dockside dining, but otherwise you’ll enjoy one of the various inside dining rooms where you can entertain yourself gazing at a variety of antique props including restored boat motors, Tiffany-style fixtures, old boating photos, even a vintage Chris Craft boat that has been redesigned into a boat booth (certainly a great seat to request on arrival). Starters such as yellowfin tuna poke set the experience in motion. Formed with an avocado and mango base, piled high with uber fresh tuna marinated in a soy lime vinaigrette, served with won ton chips dusted with chili, it’s a sure winner. Fish tacos are stuffed with jerk spiced grilled fish, slaw, slices of avocado, and a drizzling of spicy serrano chili cream sauce – too bad they are served on flour tortillas instead of the traditional corn. Quite reasonable is the steamed whole Maine lobster, tender and juicy, but, of course, lots of work. The seafood buckets are fried with a malty beer batter, but not too thick like some. CARA’S TIP: Plan your meal around a tour of Disney Springs onboard a vintage Amphicar or a romantic spin on a Venetian Water Taxi complete with Italian music, champagne, and chocolate-covered strawberries. At least take a tour of the rare boats on display outside on the restaurant’s wharf. Classic American cuisine, craft cocktails and unique entertainment at Disney Springs™ The Landing. Lunch and dinner; call (407) WDW-DINE, or (407) 960-5288, or go to theedisonfla.com for reservations. Daily lunch 11:30 a.m.-4:00 p.m. and dinner 4:30 p.m.-11 p.m.
American cuisine at Disney Springs Marketplace. Lunch and dinner. Lunch and dinner; Open daily Sun-Thur 11:00 a.m.-10:30 p.m., Fri and Sat 11:00 a.m-11:30 p.m.
Wine bar with small plates at Disney Springs™ The Landing. Lunch and dinner; call (407) WDW-DINE, or (407) 490-1800, or go to opentable.com for reservations. Open daily 11 a.m-11:55 p.m.
Wolfgang’s signature dishes at Disney Springs Marketplace. Lunch and dinner. Lunch and dinner; call (407) WDW-DINE, or (407) 815-2500 for reservations. Open daily 11:00 a.m.-11:00 p.m.